Copper Metal Stampings | Boker's, Inc.
Boker’s is a metal stamping manufacturer of copper products and components. Custom metal stampings made from copper are often used in piping, electronics, household products, and biomedical applications. Copper is easilyblanked, pierced, formed and deep drawn. Copper is also malleable and ductile– a biostatic surface that is a good conductor of heat and, when very pure, a good conductor of electricity. 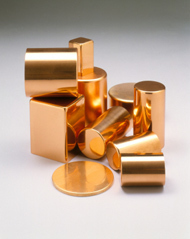 Boker’s has the capabilities to manufacture your most complex copper stampings in a range of sizes up to 12” x 12” (flat) with thicknesses from .005" to .190" and copper deep draws of up to 3” deep and 8” in diameter. To obtain a quote on your next copper metal stamping project fill out Boker’s fast quote form and submit with your production prints.